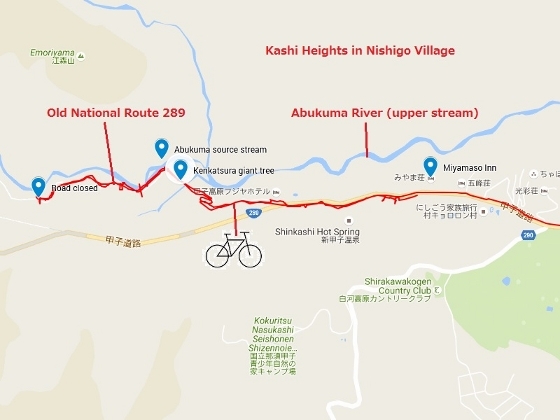 Today, I pedaled along an old National Route 289, which runs along the source stream of the Abukuma River on Kashi Heights, Nishigo Village. 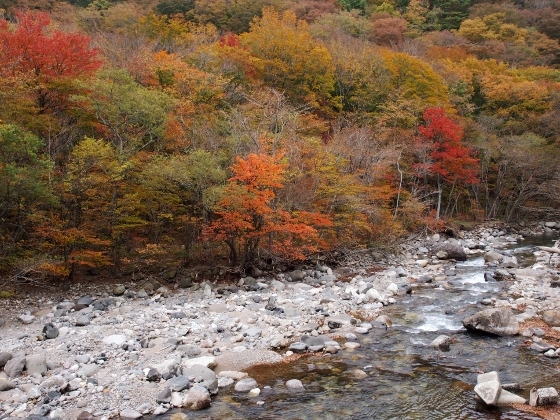 Photo shows the Abukuma River flowing through autumn colored valley. 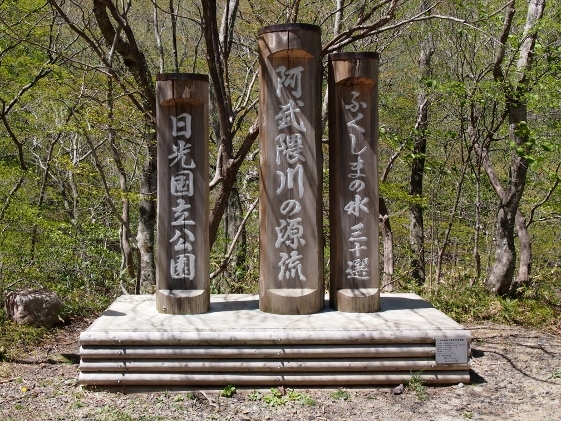 On the roadside there was a sign post as shown above, which said that this is a source stream of the Abukuma River. 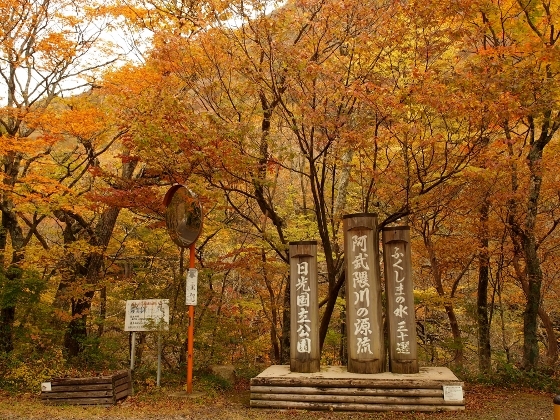 The area was surrounded by autumn yellow colors of beech trees. 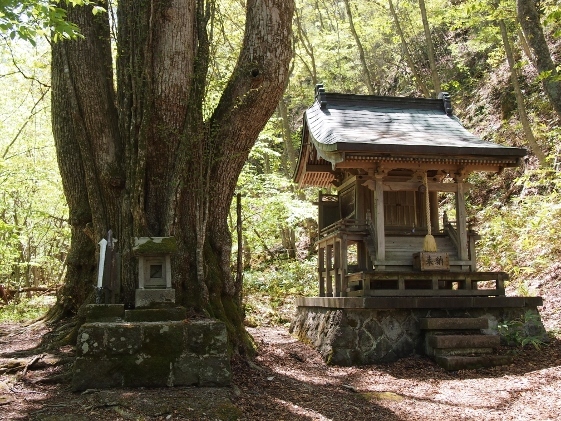 There was a large Katsura tree called Kenkatsura as shown above, which was a natural monument designated by Nishigo Village The tree is 320 years old and has been enshrined by local people as a sacred tree. There is a saber stuck into its trunk, which is considered to have conquered local evils. 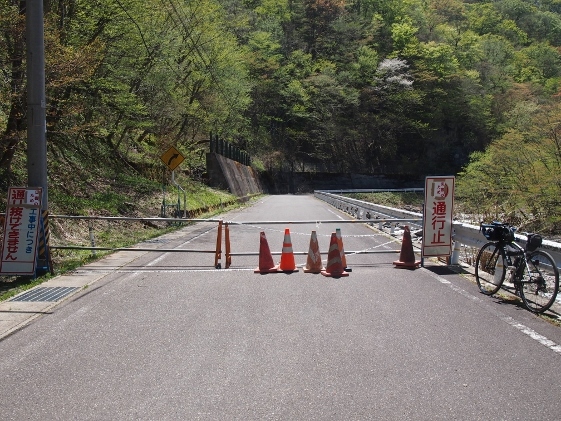 The road was blocked in the middle as shown above due to high risk of falling rocks. 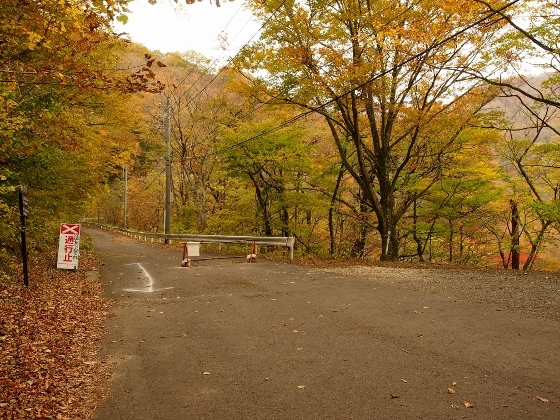 The road leads to Kashi Onsen (hot spring) about 3km away. 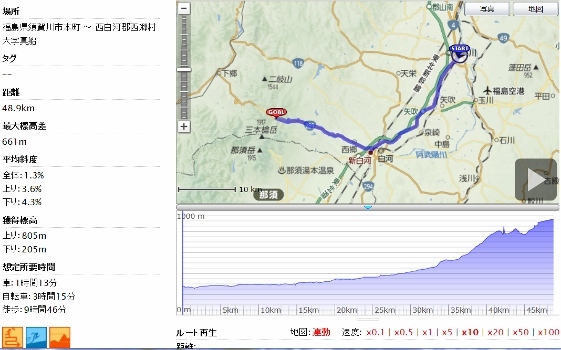 I stayed last night at Miyamaso Inn after visiting Nishinosato Trail. 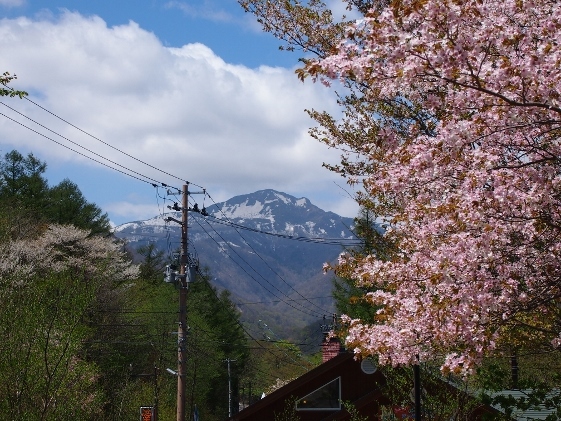 This area is called Shinkashi Onsen (hot spring resort). 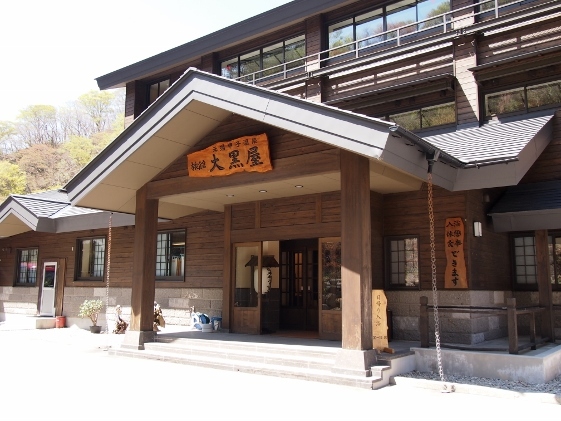 Miyamaso Inn and the adjacent Gohoso Inn share the same sulfate hot spring source, which wells up at 70 degrees Celsius in the back yard. The hot spring water was really fresh here. 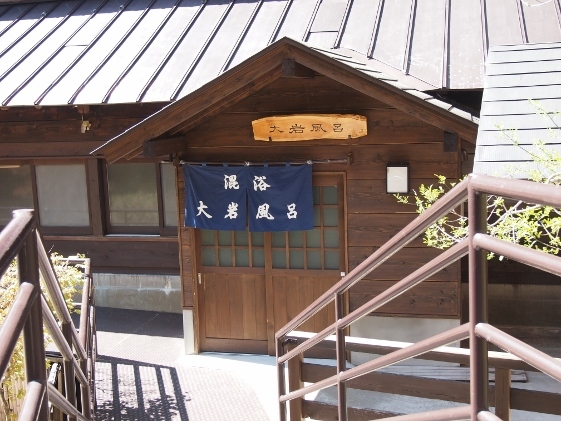 The other inns in this area use different hot spring source, which is coming all the way from Kashi Onsen 5km away. 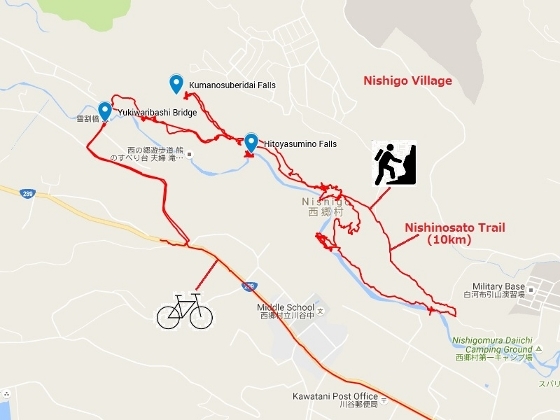 Today, I visited Nishinosato Trail at Nishigo Village. 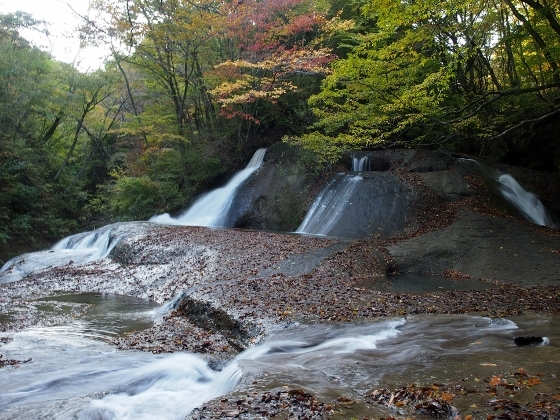 The trail goes along the upper stream of the Abukuma River and has many waterfalls. 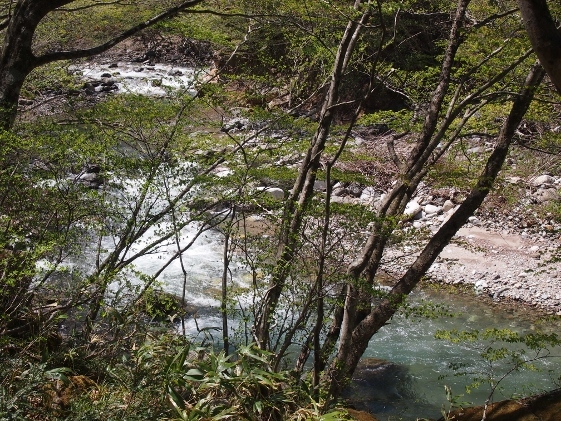 Photo above shows one of them named Kumanosuberidai or "bears' waterslide". I walked around the whole trail and it was about 10km long with steep ups and downs. 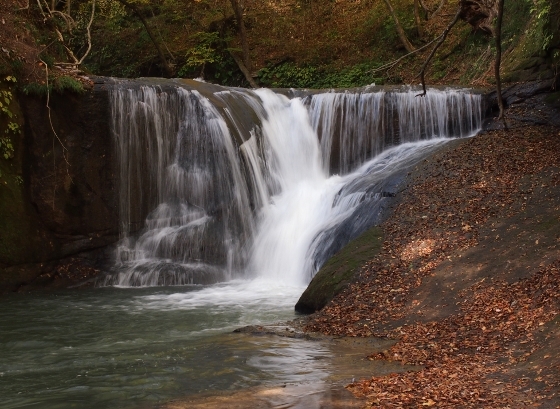 Photo above is another waterfall named Hitoyasumino-taki or "Let's get a break falls". 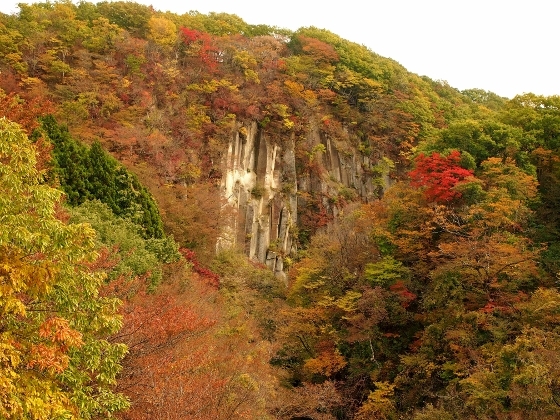 Autumn leaves around here were not fully colored, yet you can feel the atmosphere of the season. There is a scenic bridge on the western end of the trail called Yukiwaribashi Bridge, which is over a deep valley along the Abukuma River. Photos above show today's autumn views from the bridge. Maybe it will take a few more days to be fully colored. 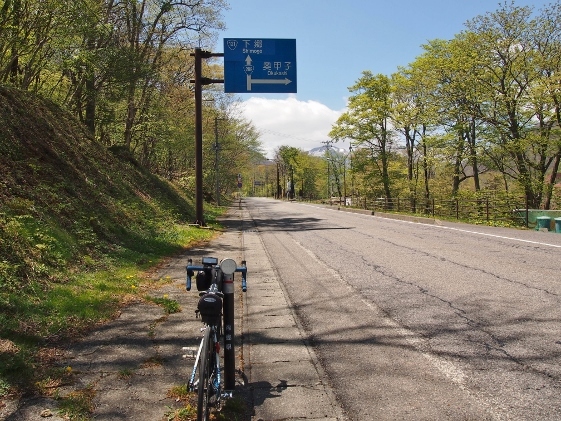 Today, I left Sukagawa City and pedaled south on the National Route 4 to Shirakawa City. Then I changed to National Route 289 and finally arrived at Kashi Onsen. 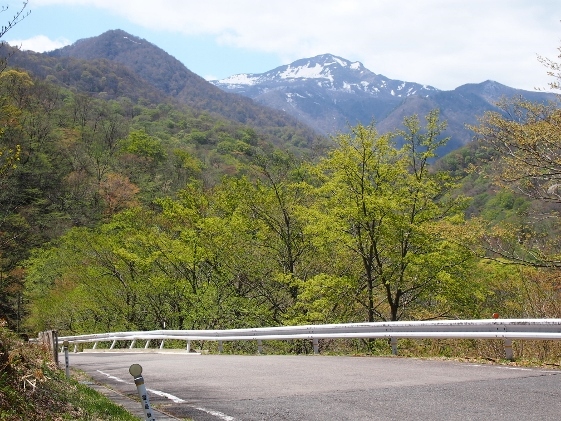 There was an old Route 289 to Kashi Onsen which branched off on the way. 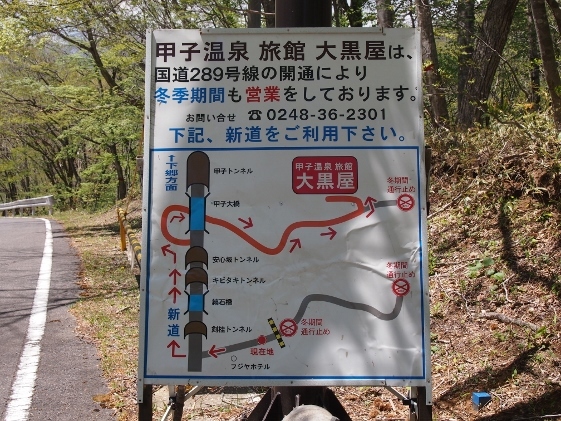 The new Route 289 has three tunnels to Kashi Onsen from the branch point for the old 289. 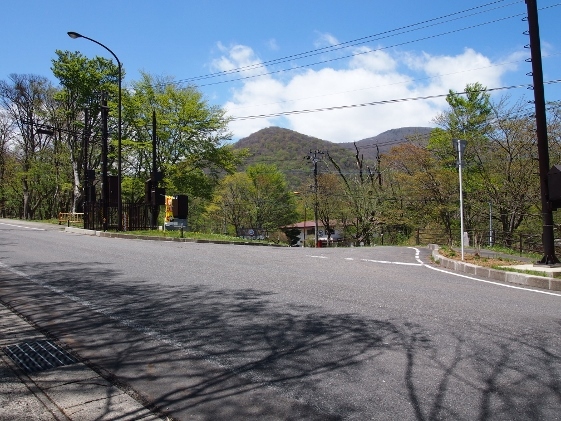 Please refer to the guide sign of Daikokuya Inn, the only inn there, recommending the new Route 289. 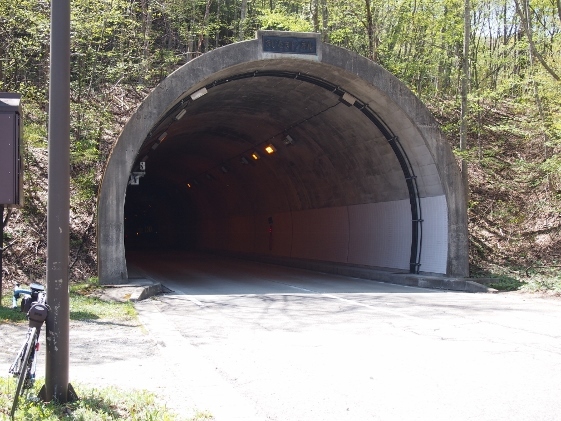 These tunnels were not safe enough for bikes. 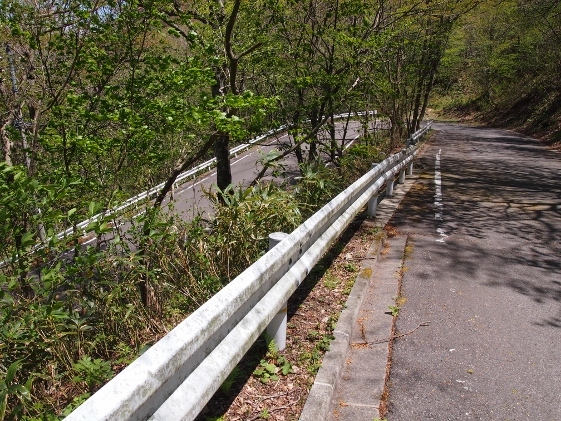 For example, the second "Kibitaki" Tunnel was dark even near the entrance, with many winding curves inside. I aimed at the old route just for avoiding tunnels. However, since the old route had been closed half way because of a disaster, actually I was forced to take the new route including tree tunnels. The pictures above show the branch sign for the old route and the branch point. Also picture of Mt. Asahi with cherry blossom was shown which was taken near the branch point. Soon after entering the old route, steep zigzag downhill road followed as shown in the picture above. 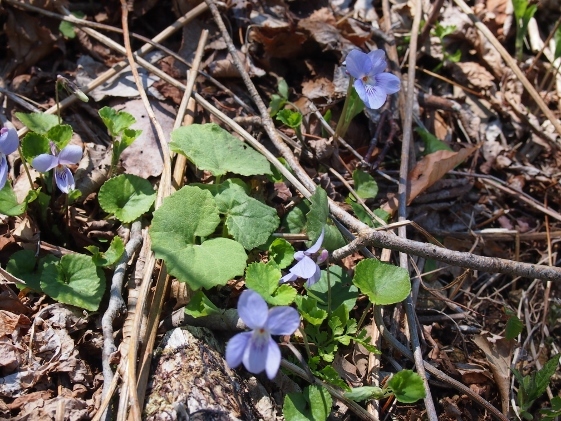 I found many viola grypoceras along the roadside. Mt. Asahi could be seen clearly. 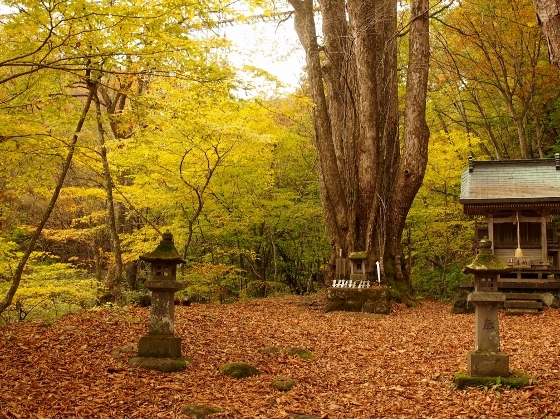 Then, there appeared "Katsura Tree with Sword" which was the natural monument of Nishigo Village. 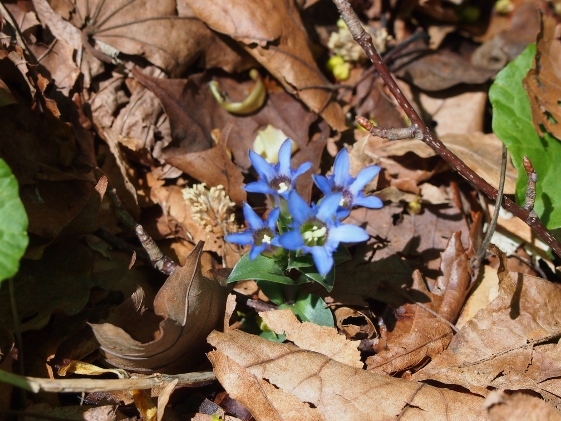 I also found gentiana nipponica as shown in the picture above. 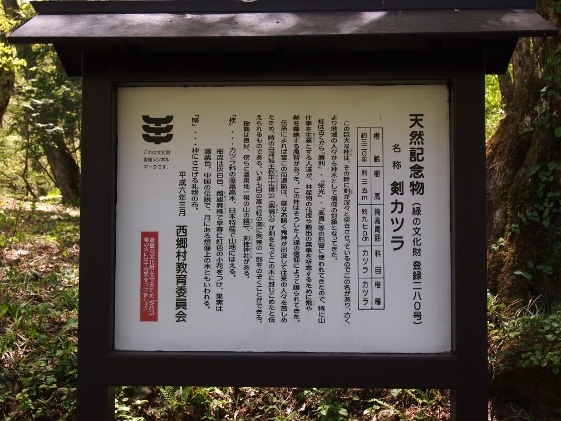 And then I found the sign for “the origin of the Abukuma River”. 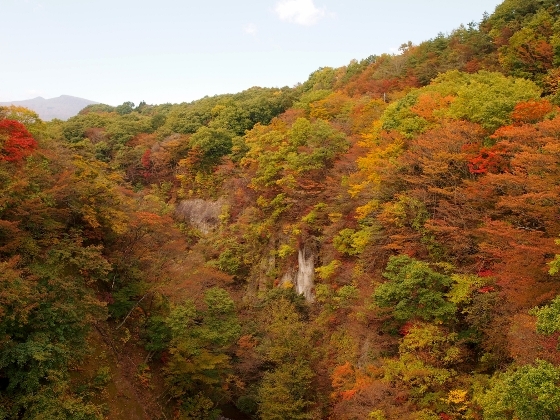 I could look over the original flow of the Abukuma River down the cliff. Then I finally found closed gate as shown in the picture above. 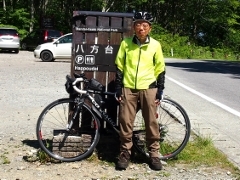 I was forced to get back climbing the zigzag road and I pedaled along the tunnels and finally arrived at Kashi Onsen safe. I found many natures along the old route compared to only tunnels for the new route. 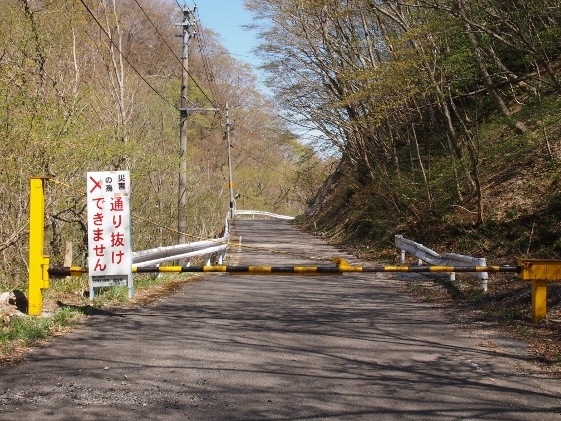 I checked the end point of the old route at Kashi Onsen and I also found closed gate as shown in the picture. A man of the inn told me that the old route will be recovered after next year. 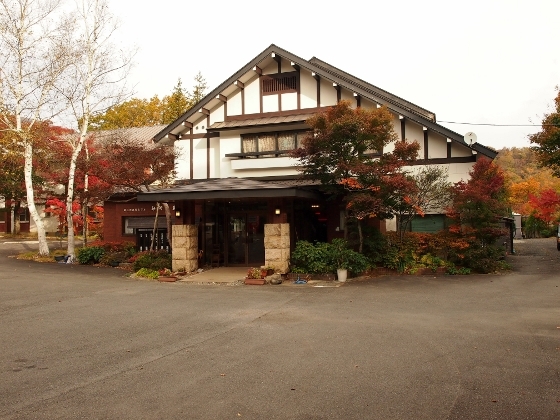 Tonight I stayed at Daikokuya Inn which was the only inn here. This inn was the member of Japan Association of Secluded Hot Spring Inns and had its own giant rock bath as shown in the pictures above. Abundant natural hot spring was flowing out of the rock near the center of the bath. I could take a long time bath of fresh hot spring water of lower temperature. There were also many day use visitors from outside Fukushima Pref.